Philip Alfred Mickelson (born June 16, 1970), nicknamed Lefty, is an American professional golfer. He has won 44 events on the PGA Tour, including five major championships: three Masters titles (2004, 2006, 2010), a PGA Championship (2005), and an Open Championship (2013). Mickelson is one of 16 players in the history of golf to win at least three of the four majors. He has won every major except the U.S. Open, where he has finished runner-up a record six times. Mickelson has spent over 25 years consecutively in the top 50 of the Official World Golf Ranking. He has spent over 700 weeks in the top-10, has reached a career-high world ranking of No. 2 several times and is a life member of the PGA Tour. Known for his left-handed swing, even though otherwise right-handed, he learned by mirroring his right-handed father's swing. He was inducted into the World Golf Hall of Fame in 2012. Mickelson was born in San Diego, California, to parents Philip Mickelson (an airline pilot and former naval aviator) and Mary Mickelson (née Santos); he was raised there and in Scottsdale, Arizona. Although otherwise right-handed, he played golf left-handed since he learned by watching his right-handed father swing, mirroring his style. Mickelson began golf under his father's instruction before starting school. Phil Sr.'s work schedule as a commercial pilot allowed them to play together several times a week and young Phil honed his creative short game on an extensive practice area in their San Diego backyard. Mickelson graduated from the University of San Diego High School in 1988. Mickelson attended Arizona State University in Tempe on a golf scholarship and became the face of amateur golf in the United States, capturing three NCAA individual championships and three Haskins Awards (1990, 1991, 1992) as the outstanding collegiate golfer. With three individual NCAA championships, he shares the record for most individual NCAA championships alongside Ben Crenshaw. Mickelson also led the Sun Devils to the NCAA team title in 1990. Over the course of his collegiate career, he won 16 tournaments. Mickelson was the second collegiate golfer to earn first-team All-American honors all four years. In 1990, he also became the first with a left-handed swing to win the U.S. Amateur title. Mickelson secured perhaps his greatest achievement as an amateur in January 1991, winning his first PGA Tour event, the Northern Telecom Open, in Tucson. At age 20, he was only the sixth amateur to win a tour event and the first in over five years after Scott Verplank at the Western Open in August 1985. Other players to accomplish this feat include Doug Sanders (1956 Canadian Open) and Gene Littler (1954 San Diego Open). With five holes remaining, Mickelson led by a stroke, but made a triple-bogey and was then three behind. The leaders ahead of him then stumbled, and he birdied 16 and 18 to win by a stroke. To date, it is the most recent win by an amateur at a PGA Tour event. That April, Mickelson was the low amateur at the Masters Tournament in Augusta, Georgia. With his two-year PGA Tour exemption from the Tucson win, he played in several tour events in 1992 while an amateur but failed to make a cut. Mickelson graduated from ASU in June 1992 and quickly turned professional. He bypassed the tour's qualifying process (Q-School) because of his 1991 win in Tucson, which earned him a two-year exemption. In early 1993, Mickelson hired Jim "Bones" Mackay as his caddy. He won many PGA Tour tournaments during this period, including the Byron Nelson Golf Classic and the World Series of Golf in 1996, the AT&T Pebble Beach National Pro-Am in 1998, the Colonial National Invitation in 2000 and the Greater Hartford Open in 2001 and again in 2002. He appeared as himself in a non-speaking role in the 1996 film Tin Cup, starring Kevin Costner. His 2000 Buick Invitational win ended Tiger Woods' streak of six consecutive victories on the PGA tour. After the win, Mickelson said, "I didn't want to be the bad guy. I wasn't trying to end the streak per se. I was just trying to win the golf tournament." 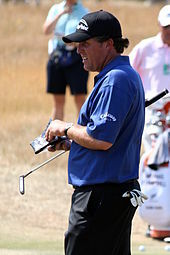 Although he had performed very well in the majors up to the end of the 2003 season (17 top-ten finishes, and six second- or third-place finishes between 1999 and 2003), Mickelson's inability to win any of them led to him frequently being described as the "best player never to win a major". Mickelson's first major championship win came in his thirteenth year on the PGA Tour in 2004, when he secured victory in the Masters with an 18-foot (5.5 m) birdie putt on the final hole. Ernie Els was the runner-up at a stroke back; the two played in different pairs in the final round and had traded birdies and eagles on the back nine. In addition to getting the "majors monkey" off his back, Mickelson was now only the third golfer with a left-handed swing to win a major, the others being New Zealander Sir Bob Charles, who won The Open Championship in 1963, and Canadian Mike Weir, who won The Masters in 2003. (Like Mickelson, Weir is a right-hander who plays left-handed.) A fourth left-handed winner is natural southpaw Bubba Watson, the Masters champion in 2012 and 2014. Prior to the Ryder Cup in 2004, Mickelson was dropped from his long-standing contract with Titleist/Acushnet Golf, after an incident when he left a voicemail message for a Callaway Golf executive. In it he praised their driver and golf ball, and thanked them for their help in getting some equipment for his brother. This memo was played to all of their salesmen, and eventually found its way back to Titleist. He was then let out of his multi-year deal with Titleist 16 months early, and signed on with Callaway Golf, his current equipment sponsor. He endured a great deal of ridicule and scrutiny from the press and fellow Ryder Cup members for his equipment change so close to the Ryder Cup matches. He faltered at the 2004 Ryder Cup with a 1–3–0 record, but refused to blame the sudden change in equipment or his practice methods for his performance. The following year, Mickelson captured his second major at the PGA Championship at Baltusrol, in a Monday final-round conclusion that had been forced by inclement weather the previous day. On the 18th hole, Mickelson hit one of his trademark soft pitches from deep greenside rough to within 18 inches (460 mm) of the cup, and made his birdie to finish at a 4-under-par total of 276, one shot ahead of Steve Elkington and Thomas Bjørn. Mickelson captured his third major title the following spring at the Masters. He won his second green jacket after shooting a 3-under-par final round, winning by two strokes over runner-up Tim Clark. This win propelled him to 2nd place in the Official World Golf Ranking (his career best), behind Woods, and ahead of Vijay Singh and Retief Goosen. After winning two majors in a row heading into the U.S. Open at Winged Foot, Mickelson was bidding to join Ben Hogan and Tiger Woods as the only players to win three consecutive majors (not necessarily in the same calendar year). Mickelson was the joint-leader going into the final round, but he was part of a wild finish to the tournament, in which he made major mistakes on the final hole and ended up in a tie for second place at +6 (286), one shot behind Geoff Ogilvy. Mickelson bogeyed the 16th hole of the final round. On the 17th hole, with the lead at +4, he missed the fairway to the left, and his drive finished inside a garbage can, from which he was granted a free drop; he parred the hole. He had a one-shot lead and was in the last group going into the final hole. Needing a par on the 18th hole for a one-shot victory, Mickelson continued with his aggressive style of play and chose to hit a driver off the tee; he hit his shot well left of the fairway (he had only hit two of thirteen fairways previously in the round). The ball bounced off a corporate hospitality tent and settled in an area of trampled-down grass that was enclosed with trees. He decided to go for the green with his second shot, rather than play it safe and pitch out into the fairway. His ball then hit a tree, and did not advance more than 50 yards (46 m). His next shot plugged into the left greenside bunker. He was unable to get up and down from there, resulting in a double bogey, and costing him a chance of winning the championship outright or getting into an 18-hole playoff with Ogilvy. After his disappointing finish, Mickelson said: "I'm still in shock. I still can't believe I did that. This one hurts more than any tournament because I had it won. Congratulations to Geoff Ogilvy on some great play. I want to thank all the people that supported me. The only thing I can say is I'm sorry." He was even more candid when he said: "I just can't believe I did that. I'm such an idiot." Frustrated with his driving accuracy, Mickelson made the decision in April 2007 to leave longtime swing coach, Rick Smith. He then began working with Butch Harmon, a former coach of Tiger Woods and Greg Norman. On May 13, Mickelson came from a stroke back on the final round to shoot a three-under 69 to win The Players Championship with an 11-under-par 277. In the U.S. Open at Oakmont in June, Mickelson missed the cut (by a stroke) for the first time in 31 majors after shooting 11 over par for 36 holes. He had been hampered by a wrist injury that was incurred while practicing in the thick rough at Oakmont a few weeks before the tournament. On September 3, 2007, Mickelson won the Deutsche Bank Championship, which is the second FedEx Cup playoff event. On the final day, he was paired with Tiger Woods, who ended up finishing two strokes behind Mickelson in a tie for second. It was the first time that Mickelson was able to beat Woods while the two stars were paired together on the final day of a tournament. The next day Mickelson announced that he would not be competing in the third FedEx Cup playoff event. The day before his withdrawal, Mickelson said during a television interview that PGA Tour Commissioner, Tim Finchem, had not responded to advice he had given him on undisclosed issues. In 2008, Mickelson won the Crowne Plaza Invitational at Colonial with a −14, one shot ahead of Tim Clark and Rod Pampling. Mickelson shot a first-round 65 to start off the tournament at −5. He ended the day tied with Brett Wetterich, two shots behind leader, Johnson Wagner. Mickelson shot a second round 68, and the third round 65, overall, being −12 for the first three rounds. On the final hole, after an absolutely horrendous tee shot, he was in thick rough with trees in his way. Many players would have punched out, and taken their chances at making par from the fairway with a good wedge shot. Instead, he pulled out a high-lofted wedge and hit his approach shot over a tree, landing on the green where he one-putted for the win. In a Men's Vogue article, Mickelson recounted his effort to lose twenty pounds (9.1 kg) with the help of trainer Sean Cochran. "Once the younger players started to come on tour, he realized that he had to start working out to maintain longevity in his career," Cochran said. Mickelson's regimen consisted of increasing flexibility and power, eating five smaller meals a day, aerobic training, and carrying his own golf bag. Mickelson won his first 2009 tour event when he defended his title at the Northern Trust Open at Riviera, one stroke ahead of Steve Stricker. The victory was Mickelson's 35th on tour; he surpassed Vijay Singh for second place on the current PGA Tour wins list. A month later, he won his 36th, and his first World Golf Championship, at the WGC-CA Championship with a one-stroke win over Nick Watney. On May 20, it was announced that his wife Amy was diagnosed with breast cancer, and Mickelson announced that he would suspend his PGA Tour schedule indefinitely. She would begin treatment with major surgery as early as the following two weeks. Mickelson was scheduled to play the HP Byron Nelson Championship May 21–24, and to defend his title May 28–31 at the Crowne Plaza Invitational at Colonial, but withdrew from both events. During the final round of the 2009 BMW PGA Championship, fellow golfer and family friend John Daly wore bright pink trousers in support of Mickelson's wife. Also, the next Saturday, at the Crowne Plaza Invitational at Colonial, a "Pink Out" event was hosted, and the PGA Tour players all wore pink that day, to support the Mickelson family. On July 6, it was announced that his mother Mary was diagnosed with breast cancer and would have surgery at the same hospital where his wife was treated. After hearing the news that his mother had been diagnosed with breast cancer, Mickelson took another leave of absence from the tour, missing The Open Championship at Turnberry. On July 28, Mickelson announced he would return in August at the WGC-Bridgestone Invitational, the week before the PGA Championship at Hazeltine National Golf Club in Chaska, Minnesota. On November 8, Mickelson won the WGC-HSBC Champions by one shot over Ernie Els in Shanghai. In 2010, Mickelson won the Masters Tournament on April 11 with a 16-under-par performance, giving him a three-stroke win over Lee Westwood. The win marked the third Masters victory for Mickelson and his fourth major championship overall. Critical to Mickelson's win was a dramatic run in the third round on Saturday in which Mickelson, trailing leader Westwood by five strokes as he prepared his approach shot to the 13th green, proceeded to make eagle, then to hole-out for eagle from 141 yards at the next hole, the par 4 14th, then on the next, the par 5 15th, to miss eagle from 81 yards by mere inches. After tapping in for birdie at 15, Mickelson, at −12, led Westwood, at −11, who had bogeyed hole 12 and failed to capitalize on the par 5 13th, settling for par. Westwood recaptured a one-stroke lead by the end of the round, but the momentum carried forward for Mickelson into round 4, where he posted a bogey-free 67 to Westwood's 71. No other pursuer was able to keep pace to the end, though K. J. Choi and Anthony Kim made notable charges. For good measure, Mickelson birdied the final hole and memorably greeted his waiting wife, Amy, with a prolonged hug and kiss. For many fans, Mickelson's finish in the tournament was especially poignant, given that Amy had been suffering from breast cancer during the preceding year. Mary Mickelson, Phil's mother, was also dealing with cancer. CBS Sports announcer Jim Nantz's call of the final birdie putt, "That's a win for the family," was seen by many as capturing the moment well. Tiger Woods had a dramatic return to competitive play after a scandal-ridden 20-week absence; he was in close contention throughout for the lead and finished tied with Choi for 4th at −11. Mickelson and others showed exciting play over the weekend, and the 2010 Masters had strong television ratings in the United States, ranking third all-time to Woods's historic wins in 1997 and 2001. Mickelson's win left him second only to Woods in major championships among his competitive contemporaries, moving him ahead of Ernie Els, Vijay Singh and Pádraig Harrington, with three major championships each and each, like Mickelson, with dozens of worldwide wins. Mickelson, one of the favorites for the U.S. Open at Pebble Beach, shot 75 and 66 on Thursday and Friday to sit two shots off the lead. However, two weekend scores of 73 gave him a T4 finish. During the remainder of the 2010 season, Mickelson had multiple opportunities to become the number one player in the world rankings following the travails of Tiger Woods. However, a string of disappointing finishes by Mickelson saw the number one spot eventually go to Englishman Lee Westwood. In the days leading up to the PGA Championship at Whistling Straits (near Kohler, Wisconsin), Mickelson announced he had been diagnosed with psoriatic arthritis. He added that he had started medical treatment, and had become a vegetarian in hopes of aiding his recovery. He maintains that both his short- and long-term prognosis are good, that the condition should have no long-term effect on his golfing career, and that he currently feels well. He also stated that the arthritis may go into permanent remission after one year of medical treatment. He went on to finish the championship T12, five shots behind winner Martin Kaymer. Mickelson started his 2011 season at the Farmers Insurance Open at Torrey Pines Golf Course. He shot 67–69–68 and was tied for the 54 hole lead with Bill Haas. Mickelson needed to hole out on the 18th hole for eagle from 74 yards to force a playoff with Bubba Watson. He hit it to 4 feet and Watson won the tournament. On April 3, Mickelson won the Shell Houston Open with a 20-under-par, three-stroke win over Scott Verplank. Mickelson rose to No. 3 in the world ranking, while Tiger Woods fell to No. 7. Mickelson had not been ranked above Woods since the week prior to the 1997 Masters Tournament. At The Open Championship, Mickelson recorded just his second top-ten finish in 18 tournaments by tying for second with Dustin Johnson. His front nine 30 put him briefly in a tie for the lead with eventual champion Darren Clarke. However, some putting problems caused him to fade from contention toward the end, to finish in a tie for second place. Mickelson made his 2012 debut at the Humana Challenge and finished tied for 49th. He missed the cut at the Farmers Insurance Open after shooting rounds of 77 and 68. In the final round of the AT&T Pebble Beach National Pro-Am, Mickelson rallied from six shots back, winning the tournament by two strokes with a final round score of 8-under 64 and a four-round total of 269. The win marked his 40th career victory on the PGA Tour. The following week at Riviera Country Club, Mickelson lost the Northern Trust Open in a three-way playoff. He had held the lead or a share of it from day one until the back nine on Sunday when Bill Haas posted the clubhouse lead at seven under par. Mickelson holed a 27-foot birdie putt on the final regulation hole to force a playoff alongside Haas and Keegan Bradley. Haas however won the playoff with a 40-foot birdie putt on the second playoff hole. The second-place finish moved Mickelson back into the world's top 10. Mickelson finished tied for third at the Masters. After opening the tournament with a two-over-par 74, he shot 68-66 in the next two rounds and ended up one stroke behind leader Peter Hanson by Saturday night. Mickelson had a poor start to his fourth round, scoring a triple-bogey when he hit his ball far to the left of the green on the par-3 4th hole, hitting the stand and landing in a bamboo plant. This ended up being Mickelson's only score over par in the whole round, and he ended with a score of eight-under overall. Earlier in the tournament he had received widespread praise for being present to watch Jack Nicklaus, Arnold Palmer, and Gary Player hit the ceremonial opening tee-shots, nearly seven hours before Mickelson's own tee time. Mickelson made a charge during the final round at the HP Byron Nelson Championship, but bogeyed the 17th and 18th, finishing T-7th. He then withdrew from the Memorial Tournament, citing mental fatigue, after a first round 79. He was to be paired with Tiger Woods and Bubba Watson at the U.S. Open. He fought to make the cut in the U.S. Open, and finished T-65th. After taking a couple of weeks off, he played in the Greenbrier Classic. Putting problems meant a second straight missed cut at the Greenbrier and a third missed cut at 2012 Open Championship, shooting 73-78 (11 over par). He finished T-43rd at the WGC-Bridgestone Invitational. He then finished T-36th at the PGA Championship. Mickelson began the 2013 season in January by playing in the Humana Challenge, where he finished T37 at −17. His next event was the following week in his home event near San Diego at the Farmers Insurance Open. Mickelson endured a disappointing tournament, finishing T51, shooting all four rounds in the 70s. At the U.S. Open at Merion, Mickelson entered the final round leading by one stroke after rounds of 67–72–70 (−1) over the first three days, but he started the final round by three-putting the 3rd and 5th holes for double-bogeys to fall out of the lead. He regained the lead at the par four 10th, when he holed his second shot from the rough for an eagle. However, a misjudgment at the short par three 13th saw him fly the green and make a bogey to slip one behind leader Justin Rose. Another bogey followed at the 15th, before narrowly missing a birdie putt on the 16th that would have tied Rose. Mickelson could not make a birdie at the 17th and after a blocked drive on the 18th, he could not hole his pitch from short of the green, which led to a final bogey. Mickelson ended up finishing tied for second with Jason Day, two strokes behind Justin Rose. It was the sixth runner-up finish of Mickelson's career at the U.S. Open, an event record and only behind Jack Nicklaus' seven runner-up finishes at The Open Championship. After the event, Mickelson called the loss heartbreaking and said "this is tough to swallow after coming so close ... I felt like this was as good an opportunity I could ask for and to not get it ... it hurts." It was also Father's Day, which happened to be his birthday. The week before The Open Championship, Mickelson warmed up for the event by winning his first tournament on British soil at the Scottish Open on July 14, after a sudden-death playoff against Branden Grace. After this victory, Mickelson spoke of his confidence ahead of his participation in the following week's major championship. Mickelson said: "I've never felt more excited going into The Open. I don't think there's a better way to get ready for a major than playing well the week before and getting into contention. Coming out on top just gives me more confidence." The following week, Mickelson won his fifth major title on July 21 at the Open Championship (often referred to as the British Open) Muirfield Golf Links in Scotland; the Open Championship is the oldest of the four major tournaments in professional golf. This was the first time in history that anyone had won both the Scottish Open and The Open Championship in the same year. Mickelson birdied four of the last six holes in a brilliant final round of 66 to win the title by three strokes. He shed tears on the 18th green after completing his round. Mickelson later said: "I played arguably the best round of my career, and shot the round of my life. The range of emotions I feel are as far apart as possible after losing the U.S. Open. But you have to be resilient in this game." In an interview before the 2015 Open, Mickelson said, "Two years removed from that win, I still can't believe how much it means to me." Mickelson missed the cut at the Masters for the first time since 1997. He failed to contend at the U.S. Open at Pinehurst in his first bid to complete the career grand slam. Mickelson's lone top-10 of the PGA Tour season came at the year's final major, the PGA Championship at Valhalla. Mickelson shot rounds of 69-67-67-66 to finish solo second, one shot behind world number one Rory McIlroy. Prior to the 2015 Masters, Mickelson's best finish in 2015 was a tie for 17th. At the Masters, Mickelson shot rounds of 70–68–67–69 to finish tied for second with Justin Rose, four shots behind champion Jordan Spieth. The second-place finish was Mickelson's tenth such finish in a major, placing him second all time only to Jack Nicklaus in that regard. At The Open Championship, Mickelson shot rounds of 70–72–70 and was eight shots behind, outside the top forty. In the final round, Mickelson birdied the 15th hole to move to 10 under and within two of the lead. After a missed 10-foot (3.0 m) birdie putt on 16, Mickelson hit his drive on the infamous Road Hole (17th) at the famed Old Course at St Andrews onto a second floor balcony of the Old Course Hotel. The out of bounds drive lead to a triple bogey 7 that sent Mickelson tumbling out of contention. After leaving Butch Harmon, Mickelson hired Andrew Getson of Grayhawk Golf Club in Scottsdale, Arizona, to serve as his new swing coach. The two worked together heavily in the 2015 offseason to get Mickelson's swing back. Under Getson's guidance, Mickelson made his 2016 debut at the CareerBuilder Challenge. He shot rounds of 68–65–66–68 to finish in a tie for third place at 21-under-par. It was only Mickelson's fifth top-five finish since his win at the 2013 Open Championship. The third-place finish was Mickelson's highest finish in his first worldwide start of a calendar year since he won the same event to begin the 2004 season. At the AT&T Pebble Beach Pro-Am, Mickelson shot rounds of 68–65–66–72 to finish in solo second place, a shot behind Vaughn Taylor. Mickelson lipped out a five-foot birdie putt to force a playoff on the 72nd hole. He entered the final round with a two stroke lead, his first 54-hole lead since the 2013 U.S. Open and was seeking to end a winless drought dating back 52 worldwide events to the 2013 Open Championship. Mickelson shot a 63 in the opening round of The Open Championship at Royal Troon. The round set a new course record and matched the previous major championship record for lowest round. Mickelson had a 15-foot (4.6 m) birdie putt that narrowly missed on the final hole to set a new major championship scoring record of 62. He followed this up with a 69 in the second round for a 10 under par total and a one shot lead over Henrik Stenson going into the weekend. In the third round, Mickelson shot a one under 70 for a total of 11 under par to enter the final round one shot back of Stenson. Despite Mickelson's bogey-free 65 in the final round, Stenson shot 63 to win by three shots. Mickelson finished 11 strokes clear of 3rd place, a major championship record for a runner up. Mickelson's 267 total set a record score for a runner up in the British Open, and only trails Mickelson's 266 at the 2001 PGA Championship as the lowest total by a runner up in major championship history. In the fall of 2016, Mickelson had two sports hernia surgeries. Those in the golf community expected him to miss much time recovering, however his unexpected return at the CareerBuilder Challenge was a triumphant one, leading to a T-21 finish. The next week, in San Diego, he narrowly missed an eagle putt on the 18th hole on Sunday that would've got him to 8-under par instead posting −7 (71-72-67-71) to finish T14 at the Farmers Insurance Open. The following week, at the Waste Management Phoenix Open, which he has won three times, he surged into contention following a Saturday 65. He played his first nine holes in 4-under 32 and sending his name to the top of the leaderboard. However, his charge faltered with bogeys at 11, 12, 14, 15, and a double bogey at the driveable 17th hole. He stumbled with a final round 71, still earning a T-16 finish, for his sixth straight top-25 finish on tour. Mickelson came close to winning again at the FedEx St. Jude Classic where he had finished in second place the previous year to Daniel Berger. He started the final round four strokes behind leaders but he quickly played himself into contention. Following a birdie at the 10th hole he vaulted to the top of leaderboard but found trouble on the 12th hole. His tee shot carried out of bounds and his fourth shot hit the water so he had to make a long putt to salvage triple-bogey. He managed to get one shot back but he finished three shots behind winner Berger, in ninth place, for the second straight year. Two weeks later he withdrew from the U.S. Open to attend his daughter's high school graduation. A week later his longtime caddie Jim (Bones) Mackay left Mickelson in a mutual agreement. Mickelson then missed the cut at both The Open Championship and the PGA Championship, shooting one of his worst rounds in a major. On September 6, days after posting his best finish of the season of T6 at the Dell Technologies Championship, Mickelson was named as a captain's pick for the Presidents Cup. This maintained a streak of 23 consecutive USA teams in the Presidents Cup and Ryder Cup, dating back to 1994. On March 4, 2018, Mickelson ended a winless drought that dated back to 2013, by capturing his third WGC championship at the WGC-Mexico Championship, with a final round score of 66 and a total score of −16. Mickelson birdied two of his last four holes and had a lengthy putt to win outright on the 72nd hole, but tied with Justin Thomas. He defeated Thomas on the first extra hole of a sudden-death playoff with a par. After Thomas had flown the green, Mickelson had a birdie to win the playoff which lipped out. Thomas however could not get up and down for par, meaning Mickelson claimed the championship. The win was Mickelson's 43rd on the PGA Tour and his first since winning the 2013 Open Championship. He also became the oldest winner of a WGC event, at age 47. In the third round of the 2018 U.S. Open, Mickelson incurred a two-stroke penalty in a controversial incident on the 13th hole when he hit his ball with intent while it was still moving. He ended up shooting 81 (+11). His former coach Butch Harmon thought Mickelson should have been disqualified. Mickelson was a captain's pick for Team USA at the 2018 Ryder Cup, held in Paris between September 28 and 30. Paired with Bryson DeChambeau in the Friday afternoon foursomes, they lost 5 and 4 to Europe's Sergio García and Alex Norén. In the Sunday singles match, Mickelson lost 4 and 2 to Francesco Molinari, as Team USA slumped to a 17.5 to 10.5 defeat. On November 23, 2018, Mickelson won the pay-per-view event, Capital One's The Match. This was a $9,000,000 winner-takes-all match against Tiger Woods at Shadow Creek Golf Course in Las Vegas. Mickelson needed four extra holes to beat Woods, which he did by holing a four-foot putt after Woods missed a seven-foot putt on the 22nd hole. In his third start of the 2019 calendar year, Mickelson won the AT&T Pebble Beach Pro-Am, shooting a bogey-free final round 65 to defeat Paul Casey by three strokes. The win was Mickelson's 44th career title on the PGA Tour, and his fifth at Pebble Beach, tying Mark O'Meara for most victories in the event. At 48 years of age, he also became the oldest winner of that event. As a competitor, Mickelson's playing style is described by many as "aggressive" and highly social. His strategy toward difficult shots (bad lies, obstructions) would tend to be considered risky. Mickelson has also been characterized by his powerful and sometimes inaccurate driver, but his excellent short game draws the most positive reviews, most of all his daring "Phil flop" shot in which a big swing with a high-lofted wedge against a tight lie flies a ball high into the air for a short distance. Mickelson is usually in the top 10 in scoring, and he led the PGA Tour in birdie average as recently as 2013. Although ranked second on the PGA Tour's all-time money list of tournament prize money won, Mickelson earns far more from endorsements than from prize money. According to one estimate of 2011 earnings (comprising salary, winnings, bonuses, endorsements and appearances) Mickelson was then the second-highest paid athlete in the United States, earning an income of over $62 million, $53 million of which came from endorsements. Major companies which Mickelson currently endorses are KPMG, ExxonMobil (Mickelson and wife Amy started a teacher sponsorship fund with the company), Rolex, Workday, Inc., Callaway Golf and Mizzen+Main. He has been previously sponsored by Titleist, Bearing Point, Barclays, and Ford. After being diagnosed with psoriatic arthritis in 2010, Mickelson was treated with Enbrel and began endorsing the drug. On May 30, 2014, The Wall Street Journal reported that the FBI and U.S. Securities and Exchange Commission (SEC) were investigating Mickelson and associates of his for insider trading in Clorox stock. Mickelson denied any wrongdoing, and the investigation found "no evidence" and concluded without any charges. On May 19, 2016, Mickelson was named as a relief defendant in another SEC complaint alleging insider trading but completely avoided criminal charges in a parallel case brought in the Federal District Court for the Southern District of New York. The action stems for trades in Dean Foods in 2012 in conjunction with confidential information provided by Thomas Davis, a former director of Dean Foods Company, who tipped his friend and "professional sports bettor" Billy Walters. The SEC did not allege that Walters actually told Mickelson of any material, nonpublic information about Dean Foods, and the SEC disgorged Mickelson of the $931,000 profit he had made from trading Dean Foods stock and had him pay prejudgment interest of $105,000. In 2017, Walters was convicted of making $40 million on Davis's private information from 2008 to 2014 by a federal jury. At that time, it was also noted that Mickelson had "once owed nearly $2 million in gambling debts to" Walters. Walters' lawyer said his client would appeal the 2017 verdict. * As of 2018 season. † Mickelson won as an amateur in 1991 and therefore did not receive any prize money. Equipment is accurate as of the 2018 WGC-Dell Technologies Match Play (March 20, 2018). ^ a b c "Phil Mickelson – Profile". PGA Tour. Retrieved March 5, 2017. ^ "The 87th PGA Championship" (PDF). PGA of America. August 15, 2005. Retrieved October 16, 2013. ^ "Mickelson's "Peaceful" Day". The Open. July 21, 2013. Archived from the original on October 16, 2013. Retrieved October 16, 2013. ^ Betscher, Fatiha. "Rory McIlroy's Historic Open Victory – 'With This Win'". Golfbytourmiss.com. ^ Casey, Phil (July 22, 2013). "Mickelson targets Grand Slam of victories after sealing Open glory at Muirfield". Daily Mail. London. Retrieved July 26, 2013. ^ Gray, Will (November 26, 2018). "Mickelson's streak hits 25 years inside OWGR top 50". Golf Channel. Retrieved November 27, 2018. ^ "World Golf Hall of Fame to induct Mickelson in 2012". PGA Tour. November 10, 2011. Retrieved July 25, 2013. ^ "Bio". February 11, 2013. Retrieved April 12, 2015. ^ a b "Phil Sr. prepared son for greatness". USA Today. August 15, 2005. Retrieved July 30, 2013. ^ "Arizona State Sun Devils profile". Archived from the original on December 3, 2013. Retrieved July 30, 2013. ^ a b "Amateur makes history in desert". Eugene Register-Guard. (Oregon). Associated Press. January 14, 1991. p. 2B. ^ "Amateur Mickelson triumphs over PGA pros". The Bulletin. (Bend, Oregon). Associated Press. January 14, 1991. p. D2. ^ Kelley, Brent. "Who Was the Last Amateur to Win on the PGA Tour, European Tour and LPGA Tour?". About.com. Retrieved July 30, 2013. ^ McCabe, Jim (August 31, 2008). "Dash and carry: Mickelson caddy makes the rounds". The Boston Globe. Retrieved July 30, 2013. ^ a b McCallum, Jack (August 19, 2002). "Major Issues". Sports Illustrated. Retrieved July 30, 2013. ^ "Masters shots to remember: Finally, they get their Phil". USA Today. April 6, 2013. Retrieved July 30, 2013. ^ Barr, Adam (September 7, 2004). "Business Edge: Mickelson, Callaway Sign Endorsement Deal". Golf Channel. Archived from the original on November 6, 2007. Retrieved November 20, 2007. ^ "Master Craftsman: Mickelson captures second green jacket". Golf.com. October 14, 2008. Retrieved July 30, 2013. ^ Wojciechowski, Gene (June 25, 2006). "Phil's Phailure will hurt for a while". ESPN. Retrieved July 30, 2013. ^ Spousta, Tom (June 20, 2006). "Ogilvy grabs U.S. Open when Mickelson, Montgomerie stumble". USA Today. Retrieved July 30, 2013. ^ "Phil Mickelson Calls Himself an Idiot". Retrieved July 30, 2013. ^ Buteau, Michael (June 19, 2006). "Mickelson, With Loss at U.S. Open, Apologizes as Golf 'Idiot'". Bloomberg. Retrieved July 30, 2013. ^ "Tips appreciated". SI.com. SportsTicker. March 4, 2006. Retrieved July 30, 2013. ^ Verdi, Bob (February 14, 2007). "Mickelson gives to Dobler family". ESPN. Retrieved July 30, 2013. ^ "Mickelson Won't Play In BMW Championship". The Washington Post. September 5, 2007. Retrieved July 30, 2013. ^ Moore, Stewart (May 22, 2008). "Crowne Plaza Invitational at Colonial: First-Round Notebook". PGA Tour. Retrieved July 30, 2013. ^ "Crowne Plaza Invitational at Colonial leaderboard". ESPN. May 25, 2008. Retrieved July 30, 2013. ^ "Birdie on 72nd hole gives Mickelson win at Colonial". PGA Tour. May 25, 2008. Retrieved July 30, 2013. ^ "How Phil Mickelson regained his stride". Golf Tips Home. Retrieved November 26, 2014. ^ "Phil Mickelson's weight loss workout". Men's Vogue. August 2008. Archived from the original on August 18, 2008. ^ "National Italian American Sports Hall of Fame – Phil Mickelson". Retrieved July 30, 2013. ^ Morfit, Cameron (June 20, 2009). "Mickelson's season on hold as wife diagnosed with breast cancer". Golf.com. Retrieved July 30, 2013. ^ "Daly Wears Pink in Final Round in Honour of Amy Mickelson". TSN. May 24, 2009. Retrieved July 30, 2013. ^ "Report: Mickelson to play June 11". ESPN. June 1, 2009. Retrieved July 30, 2013. ^ "Mickelson's mother has breast cancer". PGA Tour. July 6, 2009. Retrieved July 30, 2013. ^ "Mickelson wins Tour Championship". BBC Sport. September 27, 2009. Retrieved July 30, 2013. ^ "Phil Mickelson wins US Tour Championship as Tiger Woods pockets $10 million". The Daily Telegraph. London. September 28, 2009. Retrieved July 30, 2013. ^ "Mickelson holds off Els in China". BBC Sport. November 8, 2009. Retrieved July 30, 2013. ^ DiMeglio, Steve (April 11, 2010). "Mickelson seizes the moment, captures Masters for third time". USA Today. Retrieved July 30, 2013. ^ Dorman, Larry (April 11, 2010). "Mickelson Captures His Third Masters Title". The New York Times. Retrieved July 30, 2013. ^ "Third Time's A Charm". Golf Digest. April 11, 2010. Retrieved July 30, 2013. ^ "Masters Ratings Climb 36 Percent". ESPN. Associated Press. April 12, 2010. Retrieved July 30, 2013. ^ "Phil Mickelson wins at Pebble Beach". ESPN. Associated Press. February 13, 2012. Retrieved July 30, 2013. ^ "Bill Haas wins at Riviera in playoff". ESPN. Associated Press. February 20, 2012. Retrieved July 30, 2013. ^ "Official World Golf Ranking, Week 7, 2012" (PDF). OWGR. February 19, 2012. Retrieved July 30, 2013. ^ Dulac, Gerry (April 6, 2012). "Mickelson takes in ceremonial shots". Pittsburgh Post-Gazette. Retrieved July 30, 2013. ^ Ferguson, Doug (August 31, 2012). "Mickelson goes to the claw". Yahoo! Sports. Associated Press. Retrieved July 30, 2013. ^ a b c d "Phil Mickelson – Season". PGA Tour. Retrieved July 30, 2013. ^ Davis, John (February 4, 2012). "Phil Mickelson wins Phoenix Open, ties tournament scoring record". azcentral.com. Retrieved July 30, 2013. ^ "Justin rose wins first major at 2013 U.S. Open as Mickelson finishes second". Sky Sports. June 16, 2013. Archived from the original on June 20, 2013. Retrieved June 19, 2013. ^ Harig, Bob (June 16, 2013). "Phil Mickelson finishes second at 2013 U.S. Open". ESPN. Retrieved June 19, 2013. ^ McLean, Euan (July 15, 2013). "Scottish Open: Fabulous Phil Mickelson breaks his hoodoo". Daily Record. Glasgow. Retrieved July 16, 2013. ^ Corrigan, James (July 21, 2013). "Phil Mickelson wins fifth major title to win 142nd Open at Muirfield by three strokes". The Daily Telegraph. London. Retrieved July 22, 2013. ^ Harig, Bob (July 21, 2013). "Lefty captures Claret Jug, 5th major". ESPN. Retrieved July 22, 2013. ^ Hodgetts, Rob (July 21, 2013). "The Open 2013: Phil Mickelson cards superb 66 to win at Muirfield". BBC Sport. Retrieved July 21, 2013. ^ Douglas, Steve (July 12, 2015). "Mickelson relives British Open victory at Muirfield". Yahoo News. Associated Press. ^ Inglis, Martin (February 15, 2016). "Phil Mickelson falls agonisingly short at Pebble". bunkered. ^ Murray, Scott; Goodwin, Stuart (July 14, 2016). "The Open 2016: day one – as it happened". The Guardian. Retrieved July 15, 2016. ^ Inglis, Martin (June 20, 2017). "Phil Mickelson and caddie Bones part ways". bunkered. ^ Inglis, Martin (September 7, 2017). "Phil Mickelson gets captain's pick for Presidents Cup". bunkered. ^ "Phil Mickelson wins playoff in Mexico, ends long drought". USA Today. Associated Press. March 4, 2018. Retrieved March 6, 2018. ^ Jackson, Keith (June 17, 2018). "US Open: Butch Harmon reflects on Phil Mickelson's penalty incident". Sky Sports. Retrieved June 17, 2018. ^ "Phil Mickelson says he's sorry for hitting moving ball during US Open". The Guardian. Press Association. June 20, 2018. Retrieved June 21, 2018. ^ Strege, John (September 4, 2018). "No surprises: Tiger Woods, Phil Mickelson and Bryson DeChambeau named to U.S. Ryder Cup team". Golf Digest. ^ Murray, Ewan (September 30, 2018). "Ryder Cup 2018: Europe rout USA to exceed Thomas Bjørn's wildest dreams". The Guardian. ^ Staats, Wayne (November 23, 2018). "Phil Mickelson beats Tiger Woods in The Match on 22nd hole". PGA of America. ^ Porter, Kyle (February 11, 2019). "2019 Pebble Beach Pro-Am leaderboard, grades: Phil Mickelson takes home record fifth title". CBS Sports. Retrieved February 11, 2019. ^ McAllister, Mike (April 11, 2013). "For Mickelson, style produces substance – and a third Green Jacket". PGA Tour. Archived from the original on March 24, 2012. Retrieved July 30, 2013. ^ "What they said: Phil Mickelson". PGA Tour. May 5, 2009. Retrieved July 30, 2013. ^ Magee, David (2005). Endurance: Winning Life's Majors the Phil Mickelson Way. John Wiley & Sons. ISBN 978-0-471-72087-4. Retrieved July 30, 2013. ^ "Golf Tips – The Flop Shot". PlayersTowel.com. April 20, 2012. Archived from the original on May 13, 2013. Retrieved July 30, 2013. ^ "Phil Mickelson – Career". PGA Tour. Retrieved May 1, 2015. ^ "All-Time Money List Leaders". ESPN. Retrieved July 30, 2013. ^ Freedman, Jonah. "Ranking the 50 highest-earning athletes in the U.S." SI.com. Retrieved July 30, 2013. ^ "Phil Mickelson". Forbes. 2015. Retrieved April 29, 2016. ^ Pulliam, Susan; Rothfeld, Michael (May 30, 2014). "FBI, SEC Probe Trading of Carl Icahn, Billy Walters, Phil Mickelson". Wall Street Journal. ^ Belton, Beth (May 30, 2014). "Report: FBI, SEC probe Icahn, Mickelson and Walters". USA Today. ^ Regan, Trish (May 31, 2014). "Report: Icahn Says He's Never Out Given Inside Information". Businessweek. ^ a b "Report: Mickelson role in insider trading probe overstated". CBS News. June 12, 2014. ^ Smyth, David (May 20, 2016). "Phil Mickelson is Very Glad United States v. Newman is the Law in the Second Circuit". The National Law Review. Retrieved May 28, 2016. ^ Fischer, Douglas H.; Moreno, Joseph V.; Wharton (Clayton), Kendra (May 24, 2016). "DOJ's Failure to Charge Phil Mickelson Illustrates Difficulties in Charging Outsider Tippees with Insider Trading". The National Law Review. Retrieved May 28, 2016. ^ Moynihan, Colin; Moyer, Liz (April 7, 2017). "William T. Walters, Famed Sports Bettor, Is Guilty in Insider Trading Case". The New York Times. Retrieved April 7, 2017. ^ "Callaway Junior World Golf Championships – 1980 Champions". Junior World Golf. Archived from the original on April 21, 2011. Retrieved July 30, 2013. 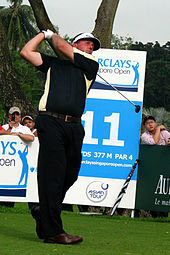 Wikimedia Commons has media related to Phil Mickelson. "Phil Mickelson collected news and commentary". The New York Times.